Hand cut fresh Romaine lettuce, imported Grana Padano & Pecorino Romano cheese, garlic croutons, tossed in our homemade Caesar dressing. Sliced pepperoni, red onions, pepperoncini, cucumbers, Roma tomatoes, Provolone, Kalamata olives and Gorgonzola cheese. Romano cheese and ricotta, wrapped in fresh fried eggplant. Topped with marinara and melted Mozzarella, served with your choice of pasta. Add cheese for .50 Cheese choices: American, sliced Provolone, Mozzarella. Pan seared Atlantic salmon, served with fresh broccoli, roasted tomato rice pilaf and topped with a sherry cream sauce. Fresh Littleneck Clams with a savory blend of peppers, onions and a crispy bacon and breadcrumb topping. Jumbo shrimp broiled and served in a garlic butter sauce with a hint of fresh oregano and seasoned bread crumbs. Perfect to dip our Italian bread in! A Sicilian delight! Silky arborio rice stuffed with creamy melted mozzarella cheese, slow simmered ground beef and spring peas. Fried crispy and delicious! Imported prosciutto, salami, capicola and soppressata, with aged cheese and fresh fire roasted red peppers, Italian olives and marinated eggplant. Fresh fried pasta, topped with sweet Italian peppers, sausage crumbles, diced Roma tomatoes, kalamata olives topped with a creamy Italian cheese sauce. Thinly sliced and delicately battered fresh eggplant stuffed with a creamy ricotta and Romano cheese filling, baked in a marinara sauce and topped with mozzarella, served with ziti. Sautéed medallions of chicken with fresh blend of mushrooms in a Dijon cream sauce, deglazed with cognac. Boneless chicken medallions sautéed with sweet Italian sausage, onions, spicy cherry peppers, potatoes, garlic, white wine and lemon. Fresh boneless chicken sautéed with peppers, onions, fresh mushrooms deglazed with sherry wine and a touch of tomato, served with ziti. Medallions of chicken sautéed in a white wine butter sauce, finished with sundried tomatoes, capers and lemon. Tender pan seared scaloppini sautéed with fresh blend of mushrooms, garlic shallots, finished with a marsala wine sauce. Jumbo shrimp sautéed with garlic, fresh in a white wine butter sauce. Served with tagliatelle. Please ask your server for today's fresh fish selection. Sautéed fresh tomatoes, sun-dried tomatoes, garlic, extra virgin olive oil. Fresh garlic and extra virgin olive oil sautéed with chopped anchovies. Fresh littleneck clams simmered with garlic and white wine; choice of red or white sauce. Your choice of pasta with a truly classic Bolognese sauce made with pork, sirloin and diced tomatoes. Topped with Parmigiano-Reggiano cheese. Braised short ribs pan seared and served with sautéed peppers, onions & mushrooms in a sherry wine marinara, served over ziti. Blend of hand chopped short rib and brisket topped with crispy bacon, Fontinella cheese and sage truffle aioli. Served on a brioche bun with truffle parmesan fries. 12 oz. choice of New York strip steak with cherry peppers, pepperoncini, onions, peppers, mushrooms and fried potatoes in sherry wine reduction. Choice of entrée, beverage & dessert. Create your own sundae! Ask your server what toppings are available. 5.99 Johnny's Passport Club! 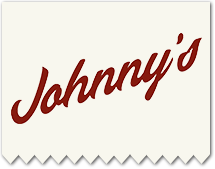 Join today and earn a FREE birthday party at Johnny's!